This series is comprised of 28 drawings. Each drawing contains a list of handwritten book titles with the word "god" in the title collected from a search on Amazon.com. 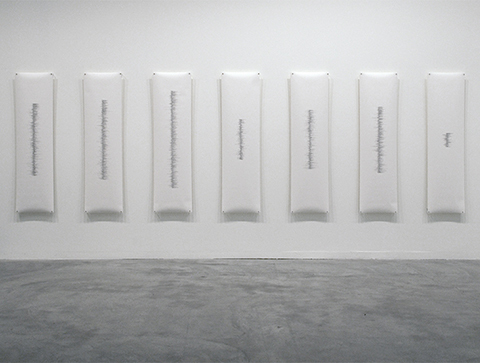 The 28 drawings each represent one of the categories used by Amazon to organize the search results. 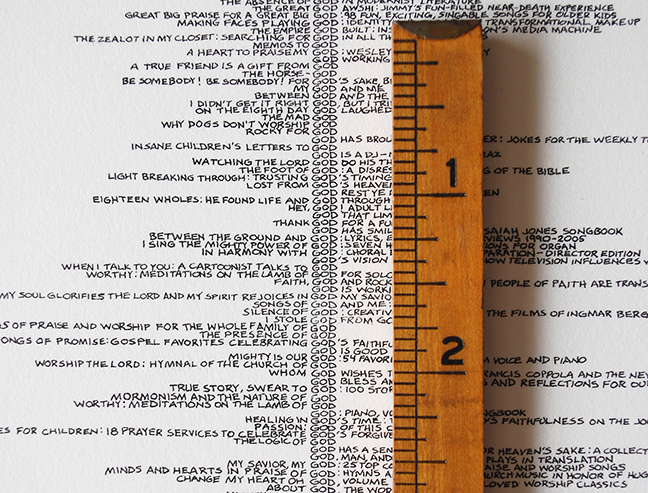 The drawings vary in length depending on the number of book titles containing the word "god" in each specific category. This project debuted at the Contemporary Art Museum, St. Louis. 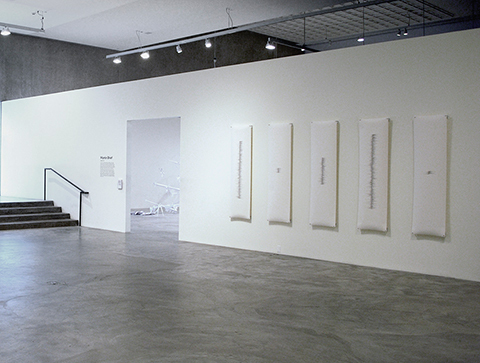 Read an interview with exhibition curator Laura Fried or see a video discussion about the exhibition. 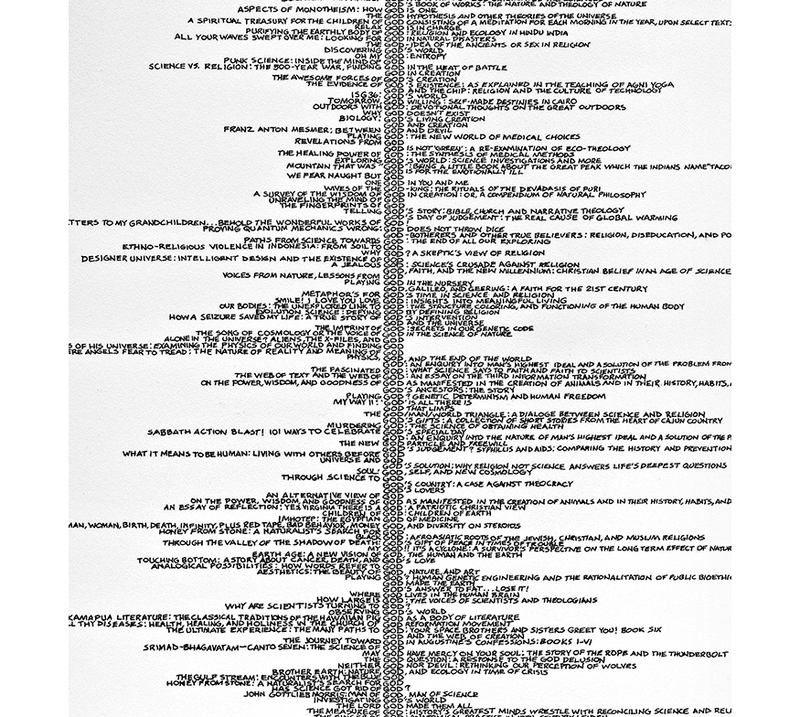 Laura Fried: Martin, your current project attends to the seemingly infinite catalog of the word "God" as it appears in titles for sale on Amazon.com. 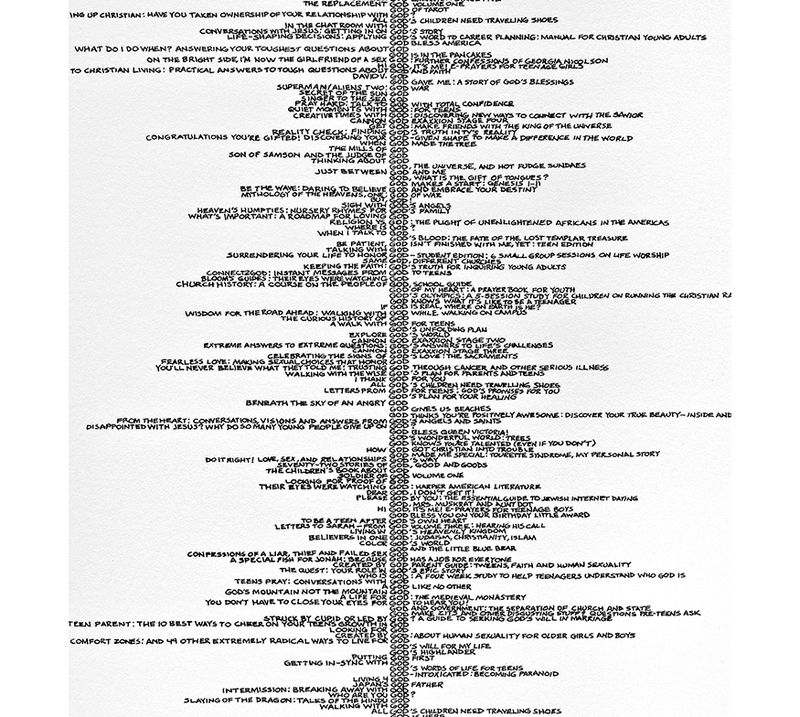 Spanning diverse literary genres—from "nonfiction" to "religion and spirituality" and even to "cooking"—this registry becomes a stream of textual data on large-scale sheets of paper. Could you describe your project? Martin Brief: Language has its limitations. Attempting to describe God using language is an absurd proposition and yet it is one that has been tried ad nauseam. This project is my foray into this Sisyphean task but with the acknowledgement (or perhaps the outright intent to demonstrate) that this is a fool's errand. My interest lies in the question of what happens if we reconfigure language and emphasize its role as form. I use very small type in my drawings because it allows language to transform into abstract form. 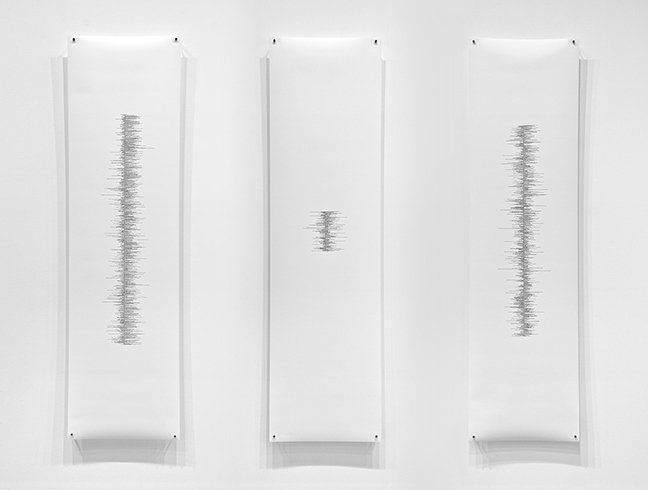 This creates a synthesis of the two systems of description; line becomes language and language becomes line. These pieces never fully settle into one system or the other. In the end, this"portrait" of God transcends its linguistic armature. LF: Could you describe your process in the studio? MB: This project began when I became curious about what a search for the word "God" on Amazon.com would yield. The result from the book department was around 700,000 items. I don't know what anyone else's response to this would be, but I found it irresistible, and my immediate instinct was to collect and use all 700,000 titles. I appreciate a challenge and can handle tedious tasks, but definitively amassing every book title seemed impossible. Ultimately I built my project around Amazon's category structure and chose to use a representative number of titles rather than the complete catalogue. This allowed me to maintain some sense of the enormity of the endeavor while making it manageable enough to complete in one lifetime. The arrangement of the titles developed very naturally. I wanted the word "God" to be the focal point of the drawings and it seemed like a logical, if not obvious, choice to arrange the titles by aligning the word into a straight vertical line. This arrangement unexpectedly created a graph-like form that placed "God" at the center as a mean value that all of the information would be measured against. LF: I have come to read these series of works as endurance tests on a micro scale. How do you reach this point in your practice? MB: Endurance test is a great description. I found it to be more a test of mental endurance than physical, although there is a physical component. My previous projects involved a similar kind of practice, although the timeline for this project forced me to work more hours per day and more days per week. At one point, I was able to spend a few weeks devoted almost exclusively to it. Transcribing book titles for six to eight hours a day for two weeks in silence proved to be an intense experience. LF: I wonder if you could elaborate on how your relationship to this loaded signifier (the word "God") has changed as you have developed these works. MB: I was interested in getting a broad sense of God through the books written on the subject. Admittedly, by using Amazon my search was impacted by market forces, and the commodification of God became readily apparent. In this context, God is used in association with every conceivable endeavor, from dating to money management, with books suggesting these can be done "God's way." I think what I see most clearly from this project is quite simply this: God has been and will likely always be ineffable, amorphous, and for sale. LF: What have previous projects looked like? MB: Drawing and language have been at the center of my practice for the past four or five years. 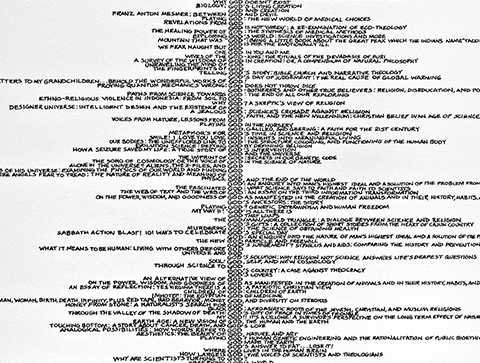 In the Dictionary and Newspaper series, I eliminated the text, instead relying on the visual patterns created by the text. In the former, I am creating one drawing for each page of the dictionary by tracing the outline of the columns of text on each page. In the latter, I filled in all of the o's in the text on the front page of randomly selected issues of the New York Times, revealing a similar sequence of dots in each drawing. In the Artforum Series, I began to use text as the raw material for the drawings, allowing it to function as both language and abstract form. 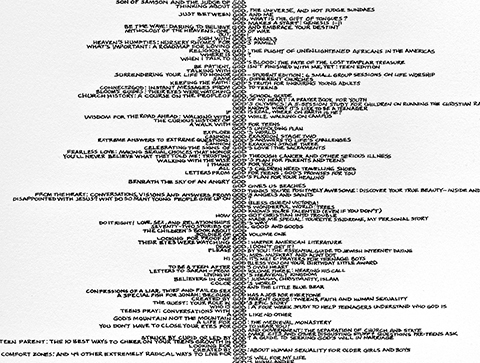 For this project, I collected all of the names from each issue of Artforum magazine for an entire year. I made one drawing for each issue, rewriting the names line by line to create a 10.5" square matching the size of the magazine. LF: Could you describe your relationship to cataloguing, taxonomies, classification . 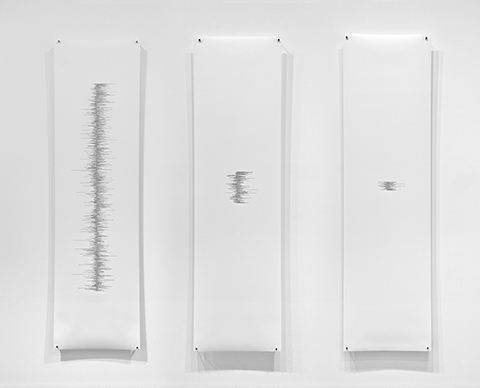 . . and how this endeavor is manifest in your nearly abstract, seismologic drawings? MB: Cataloguing is about control and, for me, the illusion of control. Similar to the idea that myths help to explain the unexplainable, these types of catalogues bring a sense of order to what can never be ordered. 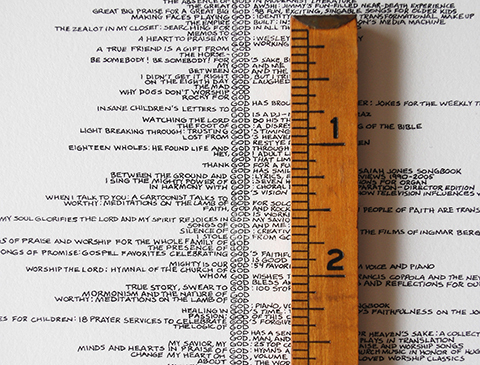 In the end, the form of the drawing relies on the order the titles appear on Amazon, the length of the titles, and how much of the title falls to the left or right of the word God. These uncontrollable factors determine the formal aspects of the drawing. Within the tight controls of the process, chaos prevails.